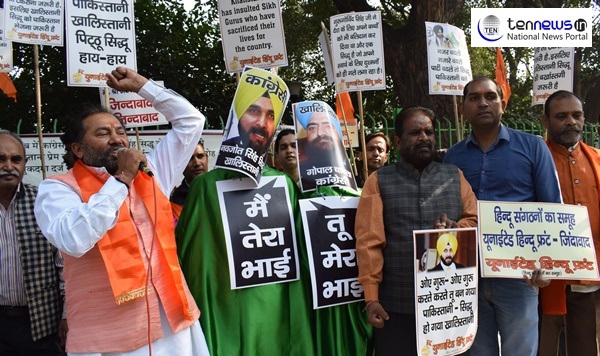 New Delhi : United Hindu Front on Saturday declared Navjot Singh Sidhu a traitor and protested against his Pakistan visit in Delhi. Ishwar Pal Tewatia, Head of, United Hindu Front, led the protest and opposed Indian National Congress by claiming Sidhu and Rahul Gandhi to be anti-nation elements. He came under a sharp attack from Shiromani Akali Dal president Sukhbir Singh Badal after a picture from the groundbreaking ceremony for the Kartarpur corridor showed him with the “separatist”. Navjot Sidhu, more than a politician was a sportsman, and sportsmen and artists were appreciated on both sides of the border and making good relations with the people on the other side of border is a very easy task for Sidhu because of his fan following. Chawla posted his photo with the Punjab minister on his Facebook page, fueling another round of barbs at Navjot Sidhu and his Pakistan outing which is just explaining how Sidhu is an anti-nation personality.